There was a lot of noise in 2015, but NXP's acquisition of Freescale stood out as the most-important development for the semiconductor company. 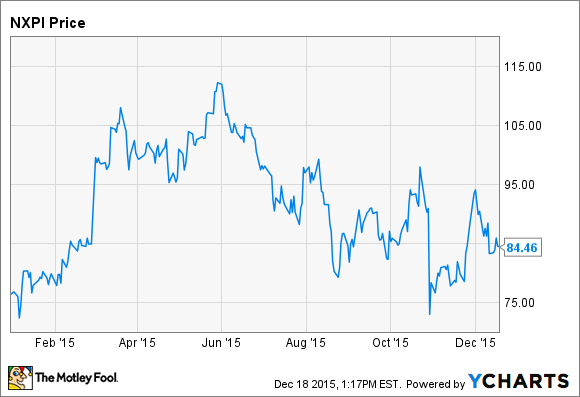 Following a multi-year rally, shares of NXP Semiconductors (NASDAQ:NXPI) have been extremely volatile in 2015. Like many semiconductor companies, weak demand is taking a toll on the company's results, and NXP expects significant revenue declines in all of its major segments during the fourth quarter. Despite these issues, there were some positive developments in 2015 for NXP. The growth of mobile payments, particularly with the launch of the Apple Watch, certainly bodes well for NXP's NFC chip business. However, one headline from 2015 stands out. On March 1, NXP announced that it was acquiring Freescale Semiconductor for $11.8 billion. The deal officially closed on December 7, making it one of the largest semiconductor mergers in history. The combined company will have annual revenues of roughly $10 billion, and about $500 million in annual synergies are expected in the long run. NXP was already the leader in a variety of areas prior to the merger, including NFC chips used to enable mobile payments and in-vehicle networking, and the company had a strong presence across many different product categories, including microcontrollers and high-performance radio-frequency solutions. Today's announcement is a transformative step in our objective to become the industry leader in high performance mixed signal solutions. The combination of NXP and Freescale creates an industry powerhouse focused on the high growth opportunities in the Smarter World. We fully expect to continue to significantly out-grow the overall market, drive world-class profitability and generate even more cash, which taken together will maximize value for both Freescale and NXP shareholders. In 2013, NXP was the fifth-largest supplier of automotive semiconductors globally, capturing about 4% of a $27.7 billion market. The acquisition of Freescale makes the combined company the largest vendor of automotive semiconductors in the world, with NXP estimating that it now has a 13% share of the highly fragmented market. Freescale's strong presence in areas like advanced driver-assistance systems and powertrain and engine management has greatly broadened NXP's automotive business. In a sense, NXP's acquisition of Freescale is a bet on the future of connected, autonomous vehicles. Gartner has predicted that, by 2020, there will be 250 million connected cars on the road, with automated driving systems becoming far more common over time. Many companies, ranging from Alphabet to General Motors, are working to bring self-driving cars to market, and other semiconductor companies are vying to get a piece of the action. In addition to strengthening NXP's presence in the automotive market, the acquisition of Freescale has also made NXP the leading supplier of microcontrollers. A microcontroller is a system-on-a-chip used for embedded applications, ranging from appliances to automobiles, and with the Internet of Things expected to connect billions of devices and objects to the Internet in the coming years, microcontrollers provide NXP with a solid long-term growth opportunity. NXP estimates that its total addressable market for microcontrollers in 2013 was $11 billion, and that following the Freescale acquisition, the combined company has a 14% market share. With the acquisition of Freescale, NXP is well positioned for two major trends: autonomous vehicles, and the Internet of Things. In the short term, industry-wide weakness will certainly weigh on the company's results; but in the long-term, NXP has plenty of growth potential.